We have been cooking up fresh, seasonal food here which is very much the theme of this week’s book, Proper Healthy Food by Nick Knowles which is full of vegan and vegetarian recipes. Nick wrote this book after going on a week-long fast in Thailand, giving up meat and returning home a changed man. I’ve chosen two hearty dishes for you to enjoy, so cook up a healthy family feast. Cook the pasta in a pan of boiling water for 3-4 minutes before adding the leeks to the pot and continuing to cook for a further five minutes. Drain the pasta and leeks and set aside. Meanwhile, make the white sauce. Melt the butter in a medium pan and stir in the flour. Cook for one minute until thick, then, off the heat, gradually whisk in the milk, keeping the mixture smooth. Return the pan to the heat and stir constantly until thickened. Simmer for two minutes, remove from the heat, and add 75g of the cheddar, the pasta and leeks. Season and stir through the parsley and season well before spooning into a two litre ovenproof dish. Sprinkle the breadcrumbs and remaining cheese over the pasta and cook in the oven for 15-20 minutes until the top is crisp and golden and the sauce is gently bubbling. Lightly grease a 20cm springform cake tin with a little sunflower oil. Place the biscuits in a sealable plastic food bag and lightly bash with the end of a wooden spoon to create a fine crumb. Tip into a bowl and mix together with the melted butter and ginger. Tip into the cake tin, pressing down firmly with the back of a spoon, and transfer to the fridge for at least 30 minutes to set. Fill a pan one-third full of water and bring to a simmer, then set a tightly fitting heatproof bowl on top of the pan, making sure the base doesn’t touch the water. Break the chocolate into the bowl and allow to melt gently, stirring occasionally. Set aside to cool a little. In a large mixing bowl, beat the double cream until it reaches a thick dropping consistency. Be careful not to over whip it until it’s too stiff. In a separate bowl, use a wooden spoon to beat together the cream cheese, icing sugar, lemon zest and cooled chocolate. Gently fold the cream through the cream cheese mixture along with 150g of the raspberries. Lightly crush the raspberries with the back of a spoon when incorporating to get a nice rippled effect. Spoon the mixture over the cheesecake base and smooth over. Allow to set in the fridge for a minimum of three hours. 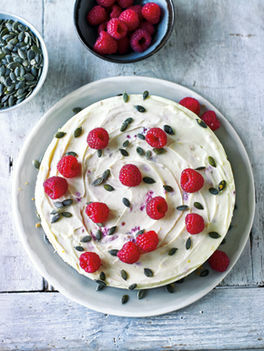 Transfer the cheesecake to a large serving plate and scatter the remaining raspberries and the pumpkin seeds over the top to decorate.